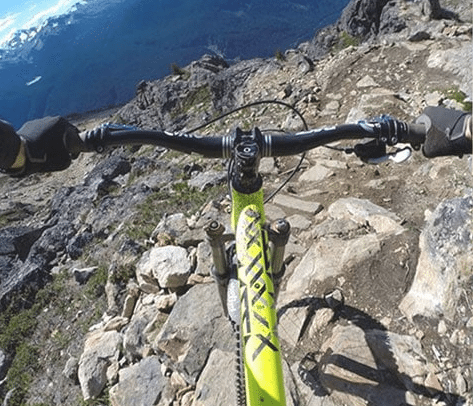 Nowadays, many of us tend to use action cameras to shoot our summer sports videos or some bicycle footage we may want to upload to Youtube. Most action cameras are compact and easy to attach to a helmet or our clothing. 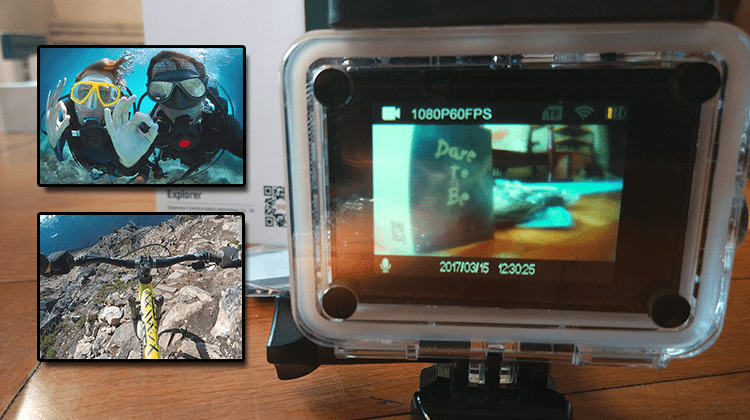 Below we are reviewing the Elephone ELE Explorer 4K, a small and cost-effective action cam that promises to deliver excellent video quality without breaking the bank. Let’s see if it can keep the promise. Do you use an action camera? 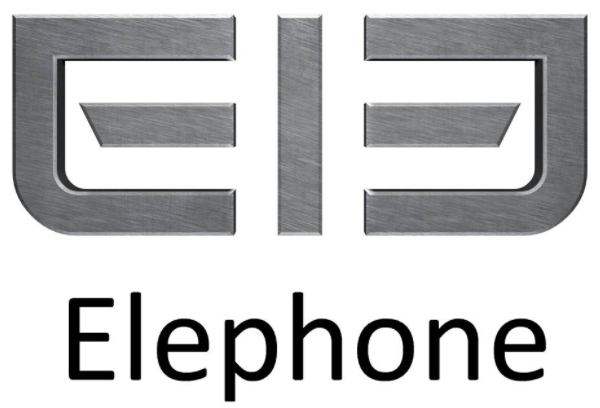 Elephone is a Chinese company established in 2006 and is known for its budget smartphones. The company focuses on delivering high-quality devices, a great user experience, and at the same time cost-effective products. Although it initially started as a smartphone company, Elephone lately has expanded on cameras, earphones, smartwatches, even on keyboards. 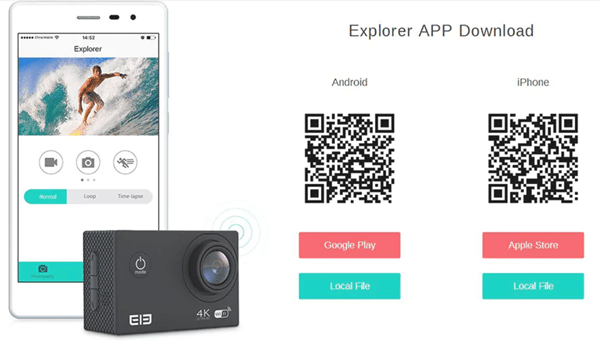 Elephone ELE Explorer 4K is one of these products, and it has gained a lot of attention from users worldwide, who seem to be satisfied with the product’s performance, for its price range. The small action cam has a 16MP OV4689 image sensor with a lens diameter of 20mm, which can shoot at a 170-degree wide angle. 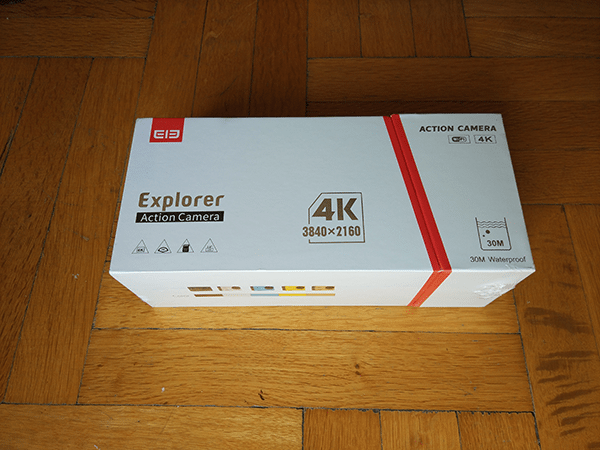 Elephone ELE Explorer 4K supports 4K footage (3840 x 2160) - as indicated by its name - but only at 15fps. However, it supports a lower resolution in higher framerates, starting from 2688 x 1520 at 30fps, and moving onto 1080p at 60fps or 30fps, depending on the user’s preferences. There’s also a 720p option at 120/60/30 fps. Furthermore, the camera can shoot photos at 16M, which is 4608 x 3546 pixels, and at lower resolutions, such as 12M (4000 x 3000), 8M (3264 x 2448), and 5M (2560 x 1920). 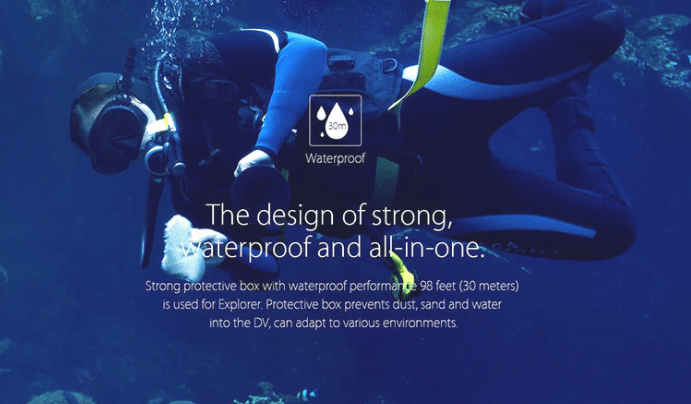 It also has a built-in microphone to record sound, and we can efficiently shoot footage in water since it comes with a waterproof case that keeps it safe at a maximum depth of 30m underwater. Elephone ELE Explorer 4K has a 2 inches LCD screen with a high resolution, but we can also operate it via a smartphone, through WiFi. To do so, we can download the Elephone app, which we’ll find in Play Store or Apple Store, depending on our phone’s software. The camera supports a microSD card at a maximum space of 64GB, but it is not included in the package. The product is minimal, and it comes with plenty of accessories so that it can fit anywhere we like. 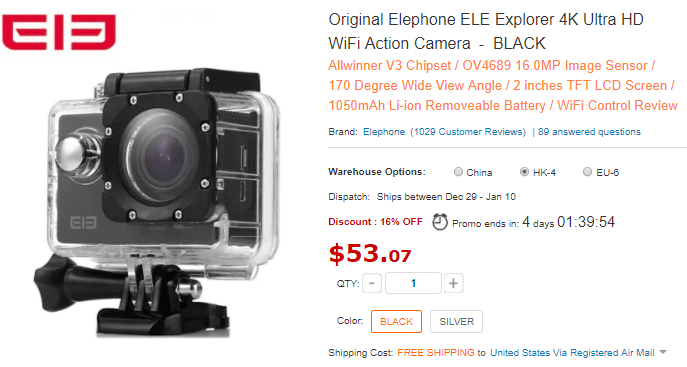 With a price of $53.07 at Gearbest, the Elephone ELE Explorer 4K is a rather cheap action cam. Moreover, it is available in five color variations; black, silver, blue, yellow, and gold. At this point, we want to thank Gearbest for providing a sample of the Elephone ELE Explorer 4K for this review. Our sample came in black color, and we must admit that the box was quite impressive. 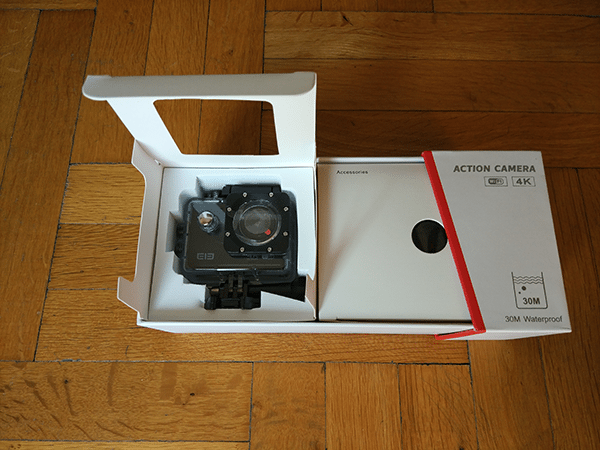 We were expecting a more simple package, based on the camera’s price. As you can see, it is a white box with red and golden details. To open it, we had to remove the plastic wrap and slide the right side. 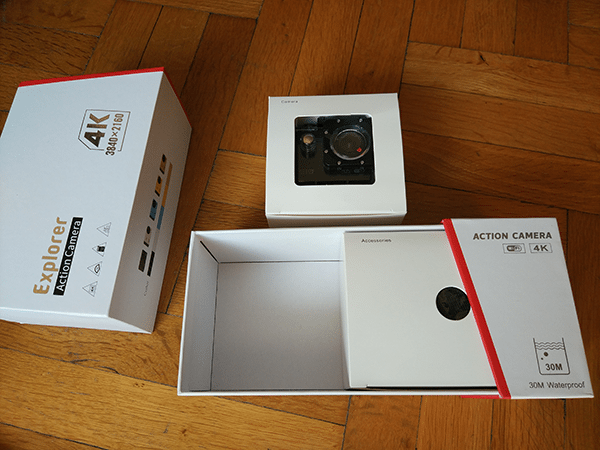 Inside the big box, we found two smaller ones; the little box contained the camera. We had to remove it, to access the bigger one. The camera was in the waterproof case by default. The second box had a bunch of accessories we were not familiar with, along with a USB cable, a microfiber cloth, some zip ties, and so on. Fortunately, we found a manual as well, plus a warranty card. With the first boot, the camera seemed ready to start shooting. Our first thoughts on the product were excellent, so we inserted a TF card and took it for a test drive. Regarding usage, the Elephone ELE Explorer 4K is very easy to operate. The camera’s menu is pretty straight-forward, and we didn’t have any problems navigating through all the settings. In general, it has two main buttons, the On/Off switch and the OK button. On the side, we will find two more buttons for Up and Down, as well as two ports; one for the USB cable plus a micro HDMI port. The SD card slot is on the same side too. The camera’s software has five sections, and we can navigate through them with the Power button. There are the video and audio sections, a slow-motion shooting screen, and one more for video playback. Last but not least, there is the Settings menu, which allows us to tweak the video or photo resolution, turn the sound on and off, change the exposure or white balance, and more. We can also pick other languages than English, but not from a wide variety. Besides the waterproof case the camera had by default, we had to deal with a massive list of extra accessories. We had no idea how to use each of them. Thus the manual was of great help. 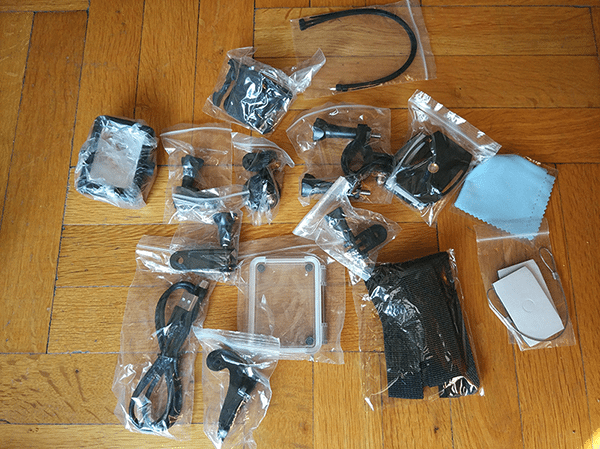 It seems that we can use the accessories to mount the Elephone ELE Explorer 4K on a bike or a helmet. It can also be attached to a tripod, and pretty much anywhere you can imagine. Shooting with the Elephone ELE Explorer 4K was a piece of cake. We first tried the 4K resolution. Since it is capable only of 15fps, this setting won’t be good with quick movements, as you can see in the video below. In scenes with little to no movement, it performed great. However, we apparently didn’t buy an action camera to stand still. 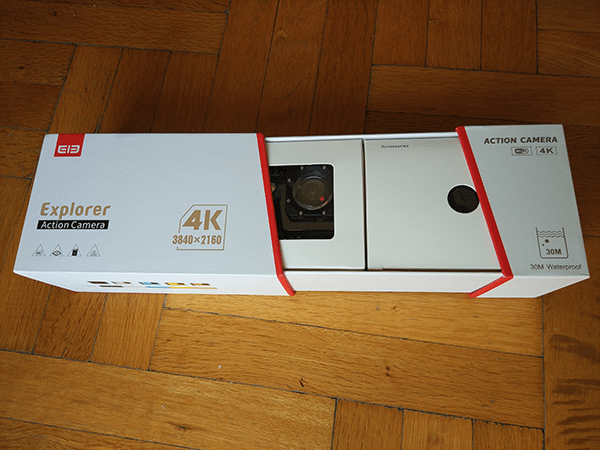 So, for those looking for 4K footage, this product is not for you. Now, that is the camera’s sweet spot. The resolution is high enough to catch plenty of details. At the same time, it provides 30fps, which is not more than a good smartphone camera, but it is nothing less either. You can see the result in our video below. At a FullHD resolution, we can shoot at 60fps or 30fps. We went with the 60fps, to compare it with the 2.7K@30fps footage. As you can see in the video, the movement feels more natural with the higher frame rate. Although, the 30fps version is good as well. We didn’t bother to upload a video with the 720p options since the 1080p resolution is the lowest standard nowadays. However, in our tests, the footage looked okay on HD resolution too. The quality was worse than the 1080p, but we didn’t expect anything different. We have to admit that the sound was somewhat disappointing. In most cases, it was distorted or not loud enough. We thought it might have to do with the waterproof case, but the sound wasn’t adequate without it either. As for the battery life, we found it at least adequate. On our tests, it lasted for about 2-3 hours of continuous shooting, which is great from our perspective. 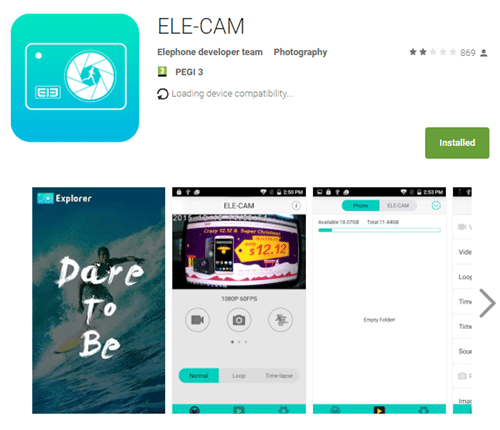 As we mentioned, Elephone has created an app to connect the camera via WiFi. 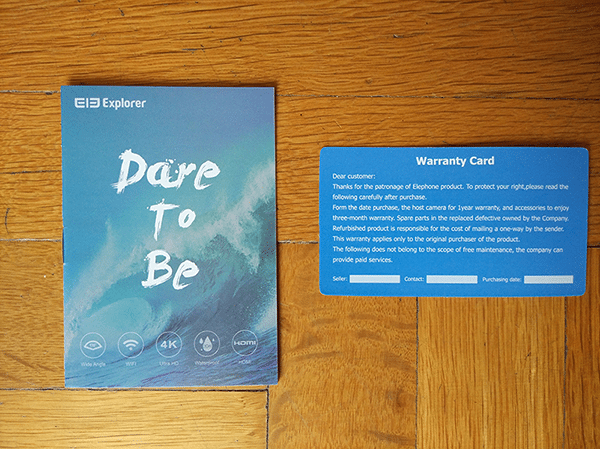 We had to download the program first, and then press the Up button on the Elephone ELE Explorer 4K. 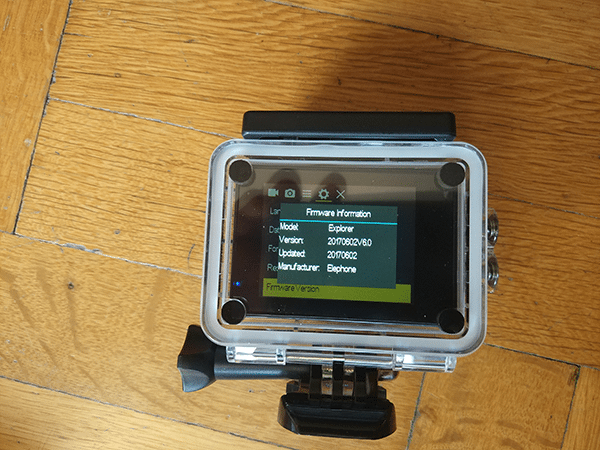 Immediately our Android phone connected to the action cam, and we could see on our screen what the camera recorded. Furthermore, the app allowed us to remotely tweak the camera’s settings, as well as manage the footage we shot. Overall, it has all the essential features we needed, but we found it occasionally crashing when we tried to playback the videos. All in all, the small action cam is worth the price. 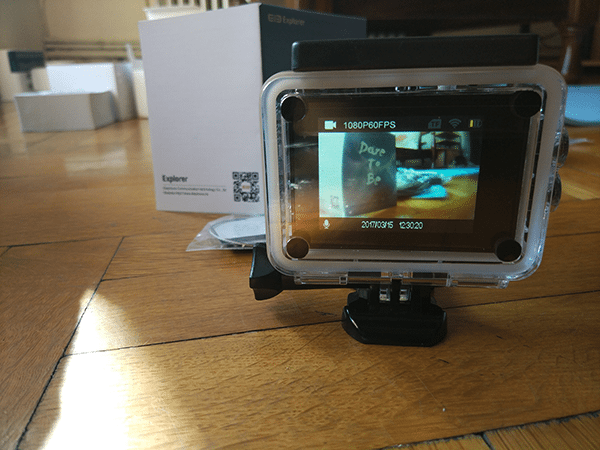 For around $50, you get an action cam with great video results in daylight situations, that can accompany you in extreme sports involving rapid movement, water, etc. 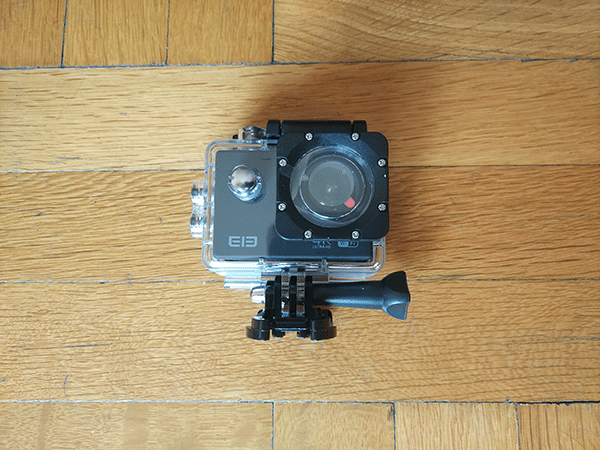 If you are looking for a cheap GoPro, then Elephone ELE Explorer 4K will fill the bill. However, if you want to shoot 4K video with a lot of movement or you are interested in the sound’s quality, we wouldn’t recommend this product. 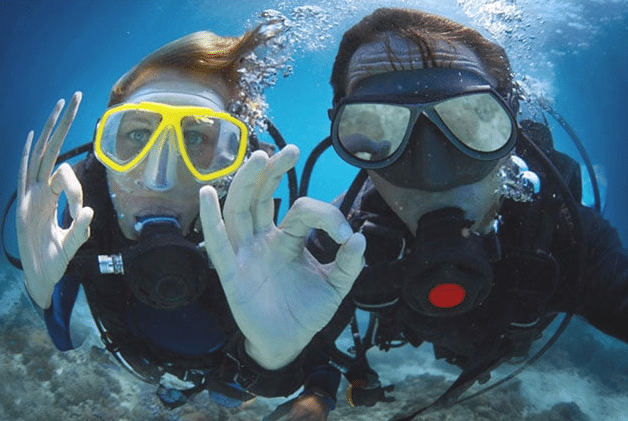 Action cameras are becoming more and more popular these days, and there is a vast variety of products out there. We enjoyed tinkering with Elephone ELE Explorer 4K camera, and we found it excellent for its price. How about you? Did you like our review? Would you like to see other similar products? 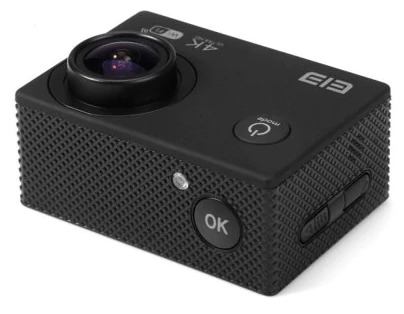 If you have any questions regarding the Elephone ELE Explorer 4K or if you want to share your experience with the action camera, feel free to leave a comment below.